Imagine your organization’s learning and development function is tasked with maintaining a large and growing library of e-learning modules. That responsibility is made harder by regular updates to external regulations or changes to the business. For the modules to remain accurate and up-to-date, your team will need to release new or refreshed content every quarter, if not more frequently. How will your team execute continuous updates and iterations while also juggling all the other learning responsibilities on their plate? Feels impossible, right? Not if you build an Agile toolkit. Putting together the right mixture of Agile tools and processes can enable your L&D team to successfully develop high-volume, high-quality e-learning. Standards: documented standards for all team members. Workflows: a team collaboration site with documented, comprehensive workflows. Corrective Action Log: a corrective action log for quality management. Baselines: clear project plans with baseline delivery dates. Consistent Communication: team huddle meetings for production planning. When equipped with these tools, your L&D team will be able to stay aligned on who’s doing what and when; quickly pivot to incoming work or urgent requests; and develop consistent, accurate learning content. To develop high-quality learning at breakneck speeds, every team member needs a clear blueprint for creating and updating content. It’s important to document standards upfront (before development) and continue updating them as the design and content for digital learning assets is iterated over time. Incorporate brand standards, including use of visuals and known writing standards. Outline different asset types and templates based on anticipated content. Establish ways to drive consistency through design features such as icon themes, wayfinding, or learning patterns. Determine targeted devices and design to the proper screen sizes. You should make updates to the standards on a regular basis as a result of items brought up on the corrective action log. The corrective action log will further drive quality management and ensure consistency across deliverables. Plus, by making regular updates, your team will get into a consistent routine of reviewing standards, which will make the whole process more efficient. A team collaboration site is vital, because it empowers everyone—instructional designers, subject matter experts, course owners, and so forth—to manage individual deliverables. When work becomes available and is ready to be executed, team members can simply pick up a task or action item and see it through. Thanks to the team collaboration site, they won’t need to wait until they are told what to do. There’s no idle time spent waiting for someone to assign them work. They’re able to pull work forward, allowing things to be addressed quicker than traditional waterfall-style approaches. When everyone on the team has visibility into what work needs to happen and when, the team can stay aligned as they leverage the right skills when needed. We recommend starting with a map of your development process, including all the steps (such as role, timing, and other dependencies) and necessary stakeholders. Then, build out that process in your team collaboration site. This will ensure that all team members have visibility into the steps it takes to develop and iterate on an individual deliverable. It will also add clarity to the tasks, making sure no step in the process gets overlooked. A good workflow also provides pathways to cycle content through the team whenever issues are found. In addition, managing to your project plan baseline will be made easier when you assign a specific number of days to each step in the process. Here’s an example of what a good workflow looks like. Remember, this exact workflow was customized to the process that made the most sense for the deliverable. Your team’s workflow should be customized to the work you need to do. Maintaining a corrective action log will help your team move from quality control to quality assurance. When we’re focused on quality control, we wind up inspecting, fixing, and republishing learning assets after the development cycles are completed. Through the corrective action log, your team can manage for a quality product that meets the standards when it comes out of production. 1. Identify all quality issues when they happen, regardless of whatever phase or workflow step the product is currently in. 2. Identify the root cause of the issue: Is the product below standard? Is there a standard in place to effectively manage for quality? Is the issue caused by human error, process error, or technical issues? 3. Determine corrective action to prevent similar issues going forward. Having baseline delivery dates in place allows your team to identify and flag any potential issues before it’s too late. When deliverables are falling behind, a clear project plan guides the entire team in holding the right conversations at the right time to ensure a successful outcome. continually revisiting the project plan and delivery dates as the work is iterated and developed. We recommend investing time and energy into setting up a detailed project plan that shows the scope of the pipeline of work to deliver and all target dates. You’ll want to highlight assets that are ahead of or behind schedule, so that your team can nimbly adjust. Armed with baseline delivery dates, your team will be able to decide whether changes to the plan need to be made—and when. Staying engaged with the team helps keep things moving. Asynchronous communication tools are great for keeping the right people connected with each other at times that are most convenient to them. It allows for quicker and more direct solutions to problems that may otherwise see a lot of churn through email. However, sometimes the fastest way to solve an issue is through a live (synchronous) conversation. That’s why we recommend regular check-ins with the team as well as ongoing communication to ensure nothing gets left on the shelf and everything keeps moving. weekly management review of high-level project status. Remember that scenario of your stressed-out L&D team? Now imagine the work they can accomplish with an Agile toolkit. They can deliver new or updated digital learning assets daily—everything between updating storyboards to delivering a final module. Their average development cycle time is cut in half, thanks to key Agile activities such as automated hand-offs and morning stand-up meetings. When faced with demands for high-volume, high-quality e-learning, we encourage teams to build an Agile toolkit. Leveraging key tools such as a team collaboration site with documented workflows and e-learning templates helps L&D teams execute work faster and more consistently to keep pace with the organization’s needs. Want to learn more? 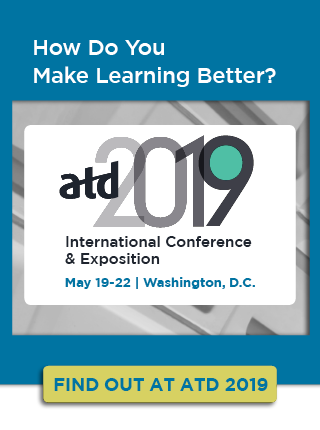 Join me at the ATD 2019 International Conference & Exposition for the session Collaborative Workflow for High Regulation, High Volume, and High Velocity. With my co-presenter Renny Hart, manager of e-learning development and training technology for Delta Air Lines, we will explore how to apply Agile and Lean principles to a learning context to build team integration and drive collaboration.